Italy’s “Ensemble Accordone” writes contemporary music for today’s listener inspired by 6th- and 16th-century musical forms. Featured Image is Ensemble Accordone in 2010. The Italian early Baroque ensemble “Ensemble Accordone” was founded in 1984 by two musicologists—composer Guido Morini (born 1959) and tenor Marco Beasley (Italian-English, born 1957). In the last decade the duo in collaboration with other musical artists has recorded and released 10 albums. This 45-minute opera composed by Moroni called Vivifice Spiritus Vitae Vis (Revive the Life Force Spirit) appeared in 2009. 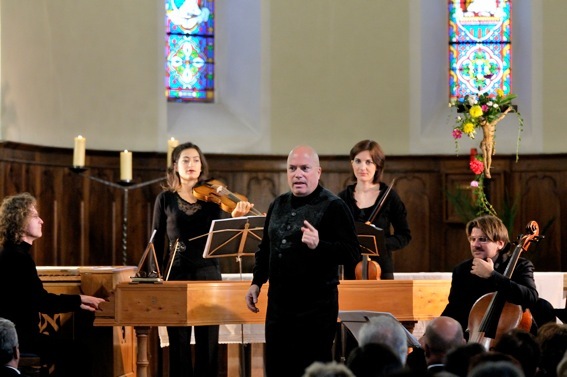 While Accordone’s main focus is arranging and performing musical literature of the fifteenth and sixteenth centuries, Vivifice Spiritus Vitae Vis is one of two recent albums by the group conceived from original compositions by Morini. In their interpretations Accordone often seeks collaboration with outside musical artists and this is the case for Vivifice Spiritus Vitae Vis, an opera in three parts. The first part is Effuderunt Aquas Nubila (Poured out of murky waters) arranged for soloists, chorus, organ and basso continuo concertante. The Helicon and Euterpe choirs as well as soloists Elisabetta de Mircovich and Claudia Caffagni are featured. Special guest musicians performing include Karen Peeters, Jaap Kruithof, Edwin Derde, and Guido Morini. The opera’s conductor is Geert Hendrix. While Vivifice Spiritus Vitae Vis is imbued with the monophonic structure of sixth century Gregorian chant and Baroque polyphony from one thousand years later, Accordone consciously strives in this album to have early music be easier for today’s listener to enjoy. While today’s listener may not recognize or be able to identify this melodious music’s traditional backbone, the manifestation of a “rigorous lyricism” demonstrates Accordone’s creative confidence in bringing early music into relevant practice for the 21st century. Vivifice Spiritus Vitae Vis is the first part of a trilogy of compositions dedicated to the Christian Trinity—Father, Son, and Spirit. By design the new commission by the Basilica Cattedrale della Vergine Assunta (Lodi Cathedral in northern Italy) is to counter today’s materialism by configuring the great religious traditions in a new way through contemporary music and words. This opera’s libretto is a new Latin translation by Ettore Garioni comprised exclusively of verses from the Old Testament. This entry was posted in Italy., Music and tagged Accordone Ensemble, Baroque music, Claudia Caffagni, Edwin Derde, Elisabetta de Mircovich, Euterpe choir, Geert Hendrix, Guido Morini, Helicon choir, Jaap Kruithof., Karen Peeters, Marco Beasley, Vivifice Spiritus Vitae Vis on December 20, 2013 by jwalsh2013.